reveal what long was hidden. is in your crypt my message? Which secrets hidden under snow? What dwells beneath my cellar door? Are you not curious to know? Is this not what you came here for? Dear traveller, woe unto you! You are condemned to haunt me. my purpose ne’er to daunt thee. to pass when you and I are one. Note: inspired by an old house which I often pass along my walks, with a reminiscence of the beginning of “The Graveyard Book” by Neil Gaiman. I wonder if you can feel a glimpse of non-dual kafkaesqueness towards the end (or better yet, its resolution? ), which I didn’t see coming until I wrote the last lines. Apparently the power of the unconscious serves a larger purpose than to capture the mystical ambiance. I hope it succeeds in both quests. in time your Spring will melt her. these lands request your presence! guard entrance to her holding. Note: Inspired by a walk through falling snow, where I saw a hedge with a hole that gave shelter to birds, and twigs with frozen ends covered in ice which resembled claws. Cailleach is known as a Winter Goddess in Celtic mythology, and her name is derived from the Old Irish language where “caillech” means “veiled one”. Today I walked the extra mile. I wondered: would it be worthwhile? yet change unfolds in different ways. return his gaze and speak: be whole! until she neared in swift-paced flight. my heart no longer numbed. for what they gave, I took. Or two? Then both were most worthwhile. … but the edited version feels more organic, more mystical, as did my experience. Today is Blog Action Day 2013. There are thousands of ways to write about this year’s theme “Human Rights” – and today you will find an abundance of inspiring posts in the blogosphere, from legislation to activism, from personal experiences to new world visions. I will take you on another journey (and shamelessly re-use ideas from my unpublished draft for last year’s Blog Action Day). My contribution is about mindsets and worldviews, in-groups and out-groups, and compassion. I want to complement all the other amazing contributions and ask: now that we have a Universal Declaration of Human Rights, what do we need to actually walk the walk? How do we need to think and feel to turn this profound vision into universal reality? My concern is this: Human Rights are meant to apply to every human being. Not your friends, not your neighbors, not your tribe, not your country – everyone. But as long as we differentiate between in- and out-groups, as long as we fail to show genuine compassion also for those dissidents and strangers and outcasts and so-called enemies, the whole concept just doesn’t fly. We will be doomed to stick with the struggle of activists against the lip-service of decision-makers. We will fervently complain about the scandalous news while ourselves turning a blind eye on the needs of next-door minorities we dislike. So even with my best intentions, and “nod-nod yes of course we’re all equal”, I treat people quite differently, putting the ones into the shiny comfy “in-group box” and the others into the dirty let’s-ship-this-far-away “out-group box”. It seems quite natural to do so, especially since we learn mostly how to compete against each other, and not so much how to cooperate with each other. There’s a fascinating experiment with pre-school kids who can give stickers to groups of other kids: by default they give far more stickers to their friends and almost none to those whom they do not like. You think that’s proof? See, even the kids do that! It must be natural then. Well … not quite. I’ll come back to that later. To act towards one another in a spirit of brotherhood requires, as far as I can see, a heart-mind that does not discriminate between who is and who is not a brother or sister, disagreements and their settlements notwithstanding. The only way to realize this is to overcome the limitations of in-group/out-group thinking. This, in turn, can be accomplished by compassion. In Buddhism the four brahmaviharas – loving kindness, compassion, sympathetic joy and equanimity – are defined as boundless states. The practitioner takes time to develop these inner qualities with regard to the entire universe and all beings within it. You don’t need Buddhism for this, nor Christianity, nor any form of spirituality. For the science lovers among us, the effects of compassion training can even be measured directly in the brain via fMRI scans! I’ve recently been to the Mind & Life Europe Symposium for Contemplative Studies where Tania Singer and her students presented many fascinating research projects and results on this subject. Yes, that would be something. Here’s another take: worldviews. How about the integration of all possible scales and flavors of mindsets and worldviews? I’ll try to explain what I mean with this, why it matters, what we can do with it, and how we can do it – including compassion (big surprise). Our worldviews can be as large and powerful as we want “us” to be. They become actualized and gain momentum by the actions we take as individuals. Therefore let’s start small: let us look inside ourselves first. We can think of the scope of our world-view in terms of where we draw the (artificial) line between “me/us” and “you/them”. These categories fluctuate and evolve from moment to moment, like a dance of viewpoints. The smallest unit would be called “egocentric”. That’s classic “I versus you (all)” thinking, likely to be activated if you feel threatened, or during competition. Here you care for yourself, period. Next come various flavors of “ethnocentric” – families, cliques, tribes, cultures and the like. Here we talk of in-groups versus out-groups, “us versus them”. We feel larger. The power of a group. Collaboration. Competition. War. With us or against us. Take one step beyond and you will encompass all humans, all life on Earth. This mindset can be called “world-centric”, or if you expand it even further, “cosmo-centric”. We are all connected. We belong together. The planet becomes one large living entity: Gaia. Deep ecology. Systems theory. Caring economics. Now our interests shift towards global or universal cooperation. Here you have a link back to compassion and the brahmaviharas – these states of our heart-minds that do not discriminate between friend and foe, inherently boundless and unconditional. This is the mindset that we need, in my humble opinion and experience, to truly grasp and realize Article 1 of the Universal Declaration of Human Rights. I think these world-view ideas are described in greater detail in Ken Wilber’s work, and also somewhat reflected in “Spiral Dynamics“, but let’s not get too distracted here. I don’t know what exactly Ken Wilber and the “Integral” people propose, but I believe that it’s also about the cultivation of more integral mindsets, akin to the cultivation of loving kindness and compassion. The best way that I know to achieve this is meditation. I also find that traveling opens my heart-mind. […] It may not be accessible for one individual human being, just as the achievements of the hive may never be accessible by any single ant alone. But as we allow for a connection between our viewpoints, and as we develop the capacity to understand and integrate other viewpoints, we may reach such a state together. And here a sense of ethics plays a role: will we use this capacity as in our past for “one group versus another”, I versus you, us versus them, … in the egocentric, ethnocentric or world-centric sense? I believe that we must get to world-centric at the very least, as follows indeed by the whole idea of a fully integrated world-view, which would otherwise be limited by our choice of inclusion and exclusion. The Gaia myth may be a valid and useful pointer to show the direction towards this sub-goal. And then, again as a consequence of this very idea, we must take it further to a universe-centric world-view. In this way we may one day become the responsible creators of life, evolutionaries of consciousness, participants in a universal community of lifeforms, skilled solution-finders on a scale which exceeds our imagination of today and of generations to come. Your comments will be warmly appreciated (and your critique will have me put these outlined principles to test :-)). In any case, thank you for reading all this! full of adventures, full of knowledge. emotion imbue your spirit and your body. unless your soul raises them up before you. to learn and yet again to learn from the sages. But you must always keep Ithaca in mind. The arrival there is your predestination. Yet do not by any means hasten your voyage. rich with all you have acquired on the way. You never hoped that Ithaca would give you riches. Ithaca has given you the lovely voyage. Without her you would not have ventured on the way. She has nothing more to give you now. Poor though you may find her, Ithaca has not deceived you. you will have understood the meaning of an Ithaca. When I read this poem I felt inspired. Yet when I recited it to two friends on Sunday, I got completely overwhelmed, and my voice cracked numerous times, and I cried passionate tears of unknown origin in the middle of the restaurant in the heart of Berlin. Something is happening, shifting, finding its way to express itself through me, while Ithaca guides me on my path and inspires my every footstep, breath and heartbeat. May it inspire you as well! Some of you know it already. I am going to write a book about my journey. Last year, in September 2012, I knew that the one book worthwhile writing (assume you can write only one in your lifetime) would be about my experiences of that summer. The work craze, physical breakdown, fear of death, recuperation, realizations, life-changing experiences. Leaving the book-to-come for a while, and turning to the present: I wouldn’t be writing this blog entry if it weren’t for Ling and Amanda Palmer. Ling is a former colleague, a soulmate and an inspiration to me. She used to work at CERN for over three years before taking her writing passion to become an editor at Médecins Sans Frontières (Doctors Without Borders). Doing so she admirably followed her bliss, and this is one way in which she inspires me. But she is also someone who makes me write. No, not with the whip and chain. ;-) Simply by the very occasional contact that we have, she is bringing the muses within me to life. I don’t know what is more surprising: the little that we see each other, or the fact that despite this scarcity I unhesitatingly call her my soulmate, without even worrying for a second whether she feels likewise. Sometimes you just know that you know someone, and I don’t mean detailed facts about one’s life. Amanda Palmer is an artist, a game changer and also an inspiration to me. Kudos to my brother for bringing her to my attention some years ago by showing me some clips from her “Who Killed Amanda Palmer” video series. Her punk-cabaret / alt-rock style wasn’t getting me nearly as much as the fact that she had started to give away her music on a “pay what you want” basis. I loved the concept, often told others about it and occasionally checked her website. Fast forward to July 2012, still amidst my work craze phase, a few days before my health came crashing down faster than I could possibly have spelled the word “testament” on a Thursday night. I learned about The Humble Bundle, an initiative that lets you choose how much to pay for a bundle of games (with a clever “beat the current average and unlock these bonus games” twist and sometimes later gratis additions to what you have already bought) or e-books, and also lets you decide who should get the money (arbitrarily split between charity, developers and initiators). Ever since that time I occasionally buy a Humble Bundle even if I never play the games, simply because I find the idea so awesome. I see it as a donation, and I am surely not alone in this. Even better, I just realized that my Humble eBook Bundle, with its contents still untouched by my gaze, actually contains the graphic novel “Signal To Noise” written by Neil Gaiman – Amanda Palmer’s husband! Now that’s one for my reading list, and the keyword to return to the main storyline. Fast forward again to 27th February 2013. The TEDxCERN organizers have arranged a TED Live stream in the Main Auditorium at CERN. We see exactly the session with Amanda Palmer’s talk in it. I’m sitting through all other talks in nervous anticipation, then start floating in my seat as soon as it’s her turn to take the stage. As for how she performs, I let my raving review in her web forum speak – and I point to the simple fact that her talk now has officially the fastest-growing viewing numbers of any TED talk in history. In other words: the world starts talking about this. And it is due time. With that she makes my day, and my heart grows to world-emcompassing proportions, and I know I must write this blog article (done – WIN! ), and just stop being shy, and write more, and share more, and dare more, to become fully alive. So now you are witnessing me crawling out of my safety shell, but I’ll do it even if you’re not looking, because I simply must. At last, once more back to Amanda Palmer’s TED talk (by the way did I mention that she recently gave a TED talk?). Fortunately she has created a lot of debate. Tons of people are profoundly inspired, and some are profoundly offended. The latter group insists, for instance, that less known artists can’t survive just by crowdfunding, or that she has made an ethical mistake in asking people to play with her on stage for free, even after her huge kickstarter success (she collected 12 times the money she had asked for). Ling put it well by saying that there is no “must” here (as in “thou shalt use kickstarter! thou shalt live only from donations! thou shalt have no other business models beside me! thou shalt starve while playing with AFP for free!”) – it’s just another option. This is diversity. All that Amanda is trying to tell us is that it is okay to ask without shame. No, actually that is not all. I think beyond the layer of music industry / arts / kickstarter dwells another, much more powerful message. You probably feel it while watching her talk. You may also read it in the hundreds of comments. This is about connections, intimacy, trust, sharing, authenticity, vulnerability, daring greatly to ask and to receive and to give something in exchange. This is not just about changing arts – it is also about changing hearts. I for one am happy and grateful for the change that is taking place within me and others. And as for that book I’m going to write – you can already tell what is coming now, right? – damn right, I’ll give it away for free as a free hug. (Donations will be gratefully accepted for sure.) Because you know, there is such a thing as a free hug. Contrary to popular belief, there is even free lunch. It’s just not common knowledge yet, but the time will come for sure. Frankly, I’ve always found this instruction difficult to compute. The stress of choice under the looming sword of Damocles. The danger of carelessness. God/Fate/your-favorite-higher-power wiggling the almighty finger: you better do it right, or else! And it’s worth taking time to reflect upon. Almost like a gardener! – Now, which tools can the gardener apply? Write down your ideas, plans, goals, experiences, successes etc. as clearly and precisely as possible, with a reference to the time and (if possible) your circumstances, sense impressions, etc. – and read them occasionally. Writing things down can help you clarify stuff, and it can make your priorities, feelings and dreams visible. Reading them can help you remember and refine your essential discoveries. You may also find recurring patterns. Add detail – the more detail, the easier for your body and your mirror neurons to res(t)imulate the state of mind you once had. When writing a diary, I’d recommend a “stream of consciousness” mode, in order to be as honest as possible. Don’t premeditate your words, just keep on writing whatever comes to your mind. Be as precise and detailed as you can, because your vague entries will be of little value – you won’t know later what you meant. When I am going through my old diary entries, I find details and honesty very helpful. Whatever truly inspires you, or energizes you, get more of it into your life. Whatever distracts you, or drains you, let go of it. This includes living beings. Little by little you will create an environment in which you can thrive. In this space you can grow your fruits, or vegetables, or crops, or flowers, whatever you wish. 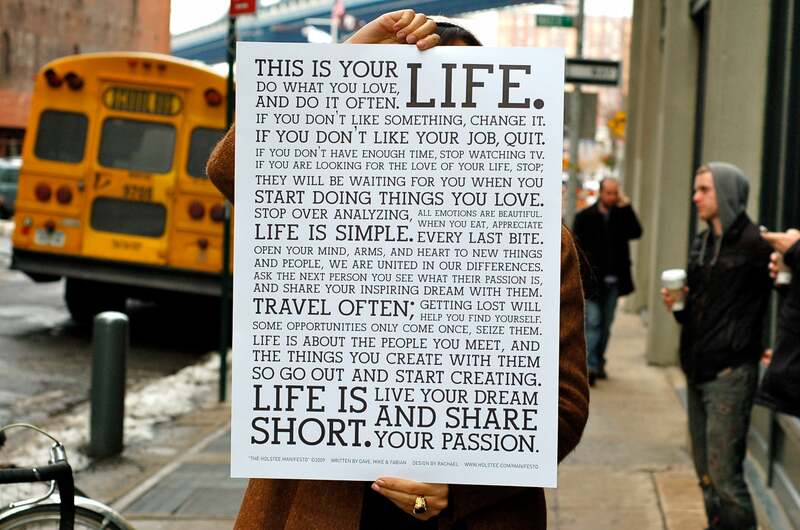 I had been using the Holstee Manifesto as my desktop background for a long while. Constant dripping wears away the stone! So many ingredients already … and there are more. I also used to read productivity and self-development blogs, and I surely benefited from them. I got inspiration from “zenhabits” and used “Joe’s Goals” to track my goals. One of my favourite resources for self-development and spirituality was “The Urban Monk”. That was all fine and helpful, but to be honest, it didn’t cut it for me. I achieved much, but I still sabotaged myself. So this was just one ingredient among many. Oh yeah, we had that already. I’ll get back to it again in part 3. Four years ago I was going through a very difficult time, struggling with emotional pain and especially with myself. Today I realize better how deeply stuck I was back then – including that my self-esteem was completely trashed and that I was actually sabotaging myself in very subtle, yet oh so powerful ways. I will spare you the details, because each and every one of us faces their own personal Nemesis from time to time, so the actual content does not matter. Hermann Hesse puts it eloquently in the “Steppenwolf” – “… wie denn jeder Mensch die ihm zufallenden Leiden für die größten hält”. The experience of magnitude of any personal challenge is per definition relative. So what does matter? First of all, there is always a way. Secondly, there is only one person who can find it – and walk it. But what is the way, and where can you find it? Many possible answers: it’s within you, you are already on it, blah blah. That probably does not do the trick either. But everything is changing, and as far as solutions to challenges are concerned, there is a two-fold change involved: internal and external. They are mirroring each other. The change happens anyway, it cannot be otherwise, so the idea will be to give it some “beneficial” direction. Let’s assume we get ideas for that – pieces for our puzzle. Here (just as everywhere) a doubt may be lurking around the corner. Can you really do “it”? Do you have what “it” takes? Will you ever learn “it”? Especially when you feel you have “failed” so often? For a movie scene you do as many “takes” as necessary … until it works. Success is often a matter of “strategy” rather than “ability”. You choose what you try, and you find out what works for you, and how it works for you – it will be a combination of many things. This is how everything contributes. Indeed it cannot be otherwise. Again, everything is changing, and we are already alive, so all it takes is to keep our senses open. Be an explorer if you like, or an adventurer, traveller, conquistador, a curious child. You are allowed to enjoy the ride! What actually worked (and still works) for me? Where doubt and fear are not. For little dreams to go! Think still of lovely things that are not true. Let wish and magic work at will in you. Be sometimes blind to sorrow. Make believe! Even now at home in immortality. Hold fast – hold fast your dreams!